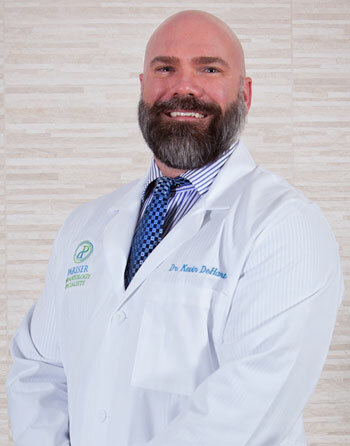 Dr. Kevin DeHart practiced in Seattle, Washington before returning home to Virginia and joining his identical twin brother at Pariser Dermatology Specialists. His dermatology interests include, but are not limited to, psoriasis, rosacea, acne, and skin cancer. He treats a wide variety of patient populations including children, teenagers, adults as well as the LGBT community. In his free time, he enjoys weightlifting, golf, racquetball, and basketball. "Securing an appointment was very easy. The appointment date was two days after making the initial call. Check-in was easy. Wait time in the reception area was minimal and I was taken back to an exam room prior to my scheduled appointment. As soon as a nurse finished taking my history in comes the dermatologist. Not a minute was wasted there. Very professional and explained everything he was doing." "Excellent care and a wonderful staff." "Great initial visit! Each staff member was courteous and efficient, and Dr. Kevin DeHart met every expectation I had as a new patient in addressing my concerns and providing excellent treatment of areas that required special attention." "Dr. DeHart made my 9-year old feel at ease and he treated her condition in a way that did not cause her any pain. The staff members are all so kind. " "Everyone made me very comfortable. I have already recommended Dr. DeHart to one of my co-workers." "Dr. DeHart is simply delightful. He is thorough and friendly and swiftly puts me at ease. I drive 3 hours to meet with him and do so for a reason. He is an excellent helper in my health maintenance routines! "